Why Did Police Officer in Traffic Stop Point Gun at Man for Nine Minutes? Did a police motorcycle cop go too far when he pointed his gun for more than nine minutes at the passenger in a car pulled over for speeding? Or did the man's reaching under his seat justify the officer’s defensive stance? That debate rages furiously on Facebook, where a driver-filmed video of the confrontation alongside Highway 101 in Northern California has been viewed more than 1.9 million times and drawn more than 8,200 comments, a little more than a week after it was first posted. To some, the video proves cops are too ready to turn hyper-aggressive, without cause. To others, it shows an officer taking a reasonable precaution, when confronted with an individual who made a suspicious movement. The furor has burned so hot that the publicly unnamed officer for the Campbell Police Department reportedly has been targeted with death threats, his superiors say. About the only thing the two sides agree on is that the officer held the gun on the man longer than is preferred. It took more than nine minutes for backup units to reach the scene, given that the traffic stop occurred 17 miles outside the Campbell city limits. Because the confrontation occurred on the busy 101 freeway during the morning commute and so far from the officer's home department, “it took an extended amount of time until other officers could arrive and provide assistance in safely resolving the situation,” the police statement said. Police officials in Campbell said they are still mulling requests by NBC News and other news outlets to release video from the other perspective — the body camera worn by the motorcycle officer. Capt. Gary Berg, the department’s spokesman, said that video will confirm the officer’s version of the incident and show that the passenger, who received a citation for failing to wear a seatbelt, apologized once the officer explained his actions. Like the police officer, the passenger and the driver involved in the July 26 traffic stop have not been identified and have not commented publicly. The video was posted on Facebook three days later under the name "Feo Mas." Though it’s impossible to tell who posted the video, it is introduced with a headline in all capitals, targeting the cop with profanity. Berg noted that several officers in California and other states have been shot recently during what seemed to be routine traffic stops. He also said that, since the incident, the Campbell policeman has been targeted with death threats via social media and emails to the Campbell police department. That is one reason that the officer, who remains on duty, has not been identified, Berg said. The motorcycle officer had been south of San Jose completing a follow-up investigation on a previous case. He was driving in the fast lane, north on Highway 101, when he saw a car in the slow lane doing 85 miles an hour, 20 mph over the posted speed limit. The cop stopped the car without incident and asked the female driver for her driver’s license, vehicle registration and proof of insurance. Because the male passenger, in his late 20s or early 30s, was allegedly riding without his seat belt, he was also asked to produce identification. The driver handed over all of her documents, but the man did not hand over an ID, so the officer told him he was required to give his name and birth date. The passenger at first declined to provide the information, but then agreed, according to Berg. The entire stop had been "cordial" to that point, Berg said. The officer then told the two people he was returning to his motorcycle. “At that point, the passenger starts leaning forward, although nothing has been requested of him at that point,” Berg said. The officer’s body-camera then records as “he clearly tells the passenger, ‘Don’t lean forward. Sit back,'" Berg said. 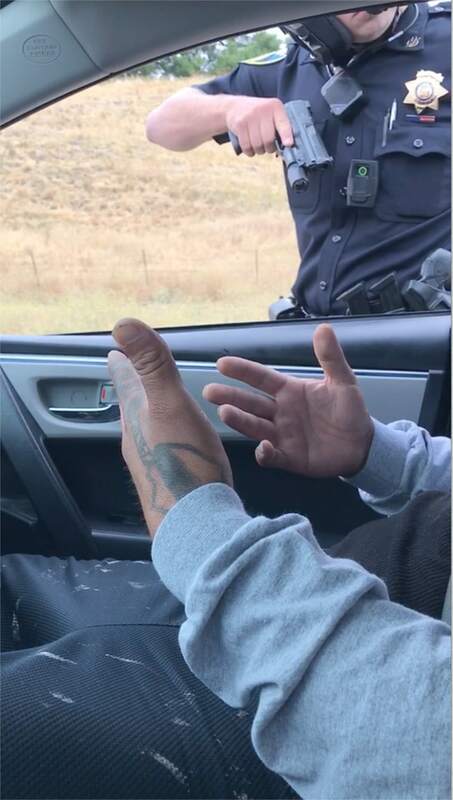 The video also shows the passenger reaching his hand toward the bottom of the seat and the officer telling him to stop, as the passenger insists he is doing nothing, according to the spokesman. “It’s at that point the officer reaches for his gun,” Berg said. Very few of the thousands of online comments on the showdown have found any middle ground. Once several backup units arrived, the passenger was taken out of the car and handcuffed. The motorcycle officer then explained to him why he had drawn his gun, according to police. And the man who had protested so vehemently listens. “And toward end of the [police] video, he actually apologizes to the officer,” Berg said.